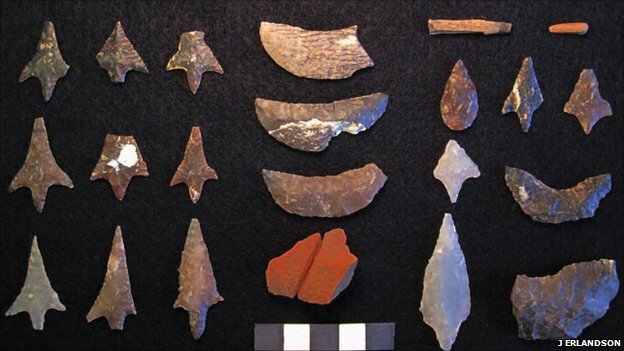 Caches of tools and animal remains from around 12,000 years ago, found on islands off the California coast, have given remarkable insight into the lives of the first Americans. The finds show fine tool technology and a rich maritime economy existed there. The tools vary markedly from mainland cultures of the era such as the Clovis. The finds, reported in Science, also suggest that rather than a land route to South America, early humans may have used coastal routes. A team studying California’s Channel Islands, off its southern coast, has found that the islands show evidence both of differing technologies and a differing diet, even among the few islands. “On San Miguel island we found a lot of pretty remarkable tools, but the animal materials there were largely shellfish,” said Torben Rick, an anthropologist from the Smithsonian Institution in Washington DC. “Over on Santa Rosa, that site was dominated by bird remains and a few sea mammal and fish remains… and no shellfish at all. “As more research produces more sites, we will see that the story of the first Americans is not linear and that there will continue to be more surprises” -Tom Dillehay, Vanderbilt University. The tools that the team found hold the greatest surprise, however, in that they differ significantly from those of mainland cultures like the Clovis and Folsom. Points found on the islands – which could even be arrow-heads – are thin, serrated, and have barbed points that show striking workmanship for the period. Inland tools had fluted points, and it is known they were used to hunt large animals including the woolly mammoth. The island points were so delicate as to almost certainly have been used for hunting fish. What is more, many of them do not reappear in the archaeological record. Dr Rick said that the evidence supported the idea that the islands were short-term or seasonal encampments, rather than permanent settlements. The team also found a piece of obsidian on the islands. “The Coso obsidian source [is] on the mainland a couple hundred miles away, so we know they were participating in long-distance exchange networks,” he said. A long-standing model of human exploration and settlement of the Americas holds that, after reaching North America through the Bering Straits off Alaska, a concerted push southward led early humans including the Clovis culture across inland parts of the continent to South America. But anthropologist Tom Dillehay of Vanderbilt University said that the Channel Island finds were part of a mounting body of evidence against that simplistic story. “What they tell us is that there was widespread cultural diversity at the outset of human entry and dispersion throughout the Americas, and that the old, now-dead Clovis first model often misleads us to believe that there was only one major way of first human expansion throughout the Western Hemisphere,” he told BBC News. “As today, there are cultural continuities but there also is constant change, which is well evidenced by these and other sites being discovered throughout the Americas. As more research produces more sites, we will see that the story of the first Americans is not linear and that there will continue to be more surprises. However, Dr Rick said that it was too early to upend the larger picture of human migration across the Americas, and that further finds – some of which now lie underwater around the Channel Islands – could shed more light on the story in the future. “My colleague Jon Erlandson refers to them as ‘postcards from the past’,” Dr Rick said. “They give us just a brief snapshot of ‘hey, we were here and here’s what we were doing for a brief period of time’. Neanderthal guys were no girlie-men. Prehistoric man apparently boasted a rock-hard body, including an overdeveloped right arm that would make Popeye jealous, according to a new scientific report. The Neanderthals hunted in the “extreme,” Russian Prof. Maria Mednikova told Discovery News. She said instead of shooting prey with a bow and arrow, the Neanderthal man used “direct contact” with his victim, stabbing animals with a spear and giving his dominant arm, usually the right one, an intense workout. The professor said female Neanderthals were strong, but more evenly muscular in both arms. Either way, Neanderthals make modern-day humans look wimpy. Of course, they had some chemical help, it seems. Mednikova says their strong, thick bone structure was aided by a “markedly androgenic constitution.” Simply put, the Neanderthal body was brimming with natural steroids. Genes, a cold climate and an all-meat diet helped contribute to the Neanderthal’s buff body, the scientists believe. 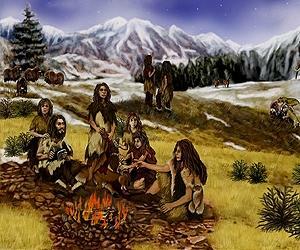 Neanderthal’s dined on mammoths and deer, among other plant-eating animals. The scientists based their research on an analysis of Neanderthal arm bone, dating roughly from 100,000 years ago and found in what is now Russia. Their findings were published in the journal Archaeology, Ethnology and Anthropology of Eurasia. “We can now say that, in all probability, there was gene flow from Neanderthals to modern humans,” said the paper’s first author, Richard E. (Ed) Green of the University of California, Santa Cruz. Green, now an assistant professor of biomolecular engineering in the Baskin School of Engineering at UC Santa Cruz, began working on the Neanderthal genome as a postdoctoral researcher at the Max Planck Institute for Evolutionary Anthropology in Leipzig, Germany. Svante Paabo, director of the institute’s genetics department, leads the Neanderthal Genome Project, which involves an international consortium of researchers. David Reich, a population geneticist at the Broad Institute of MIT and Harvard, also played a leading role in the new study and the ongoing investigation of the Neanderthal genome. “The Neanderthal genome sequence allows us to begin to define all those features in our genome where we differ from all other organisms on the planet, including our closest evolutionary relative, the Neanderthals,” Paabo said. The draft Neanderthal sequence is probably riddled with errors, Green said, but having the human and chimpanzee genomes for comparison makes it extremely useful despite its limitations. Places where humans differ from chimps, while Neanderthals still have the ancestral chimp sequence, may represent uniquely human genetic traits. Such comparisons enabled the researchers to catalog the genetic changes that have become fixed or have risen to high frequency in modern humans during the past few hundred thousand years. The evidence for more recent gene flow between Neanderthals and humans came from an analysis showing that Neanderthals are more closely related to some present-day humans than to others. The researchers looked at places where the DNA sequence is known to vary among individuals by a single “letter.” Comparing different individuals with Neanderthals, they asked how frequently the Neanderthal sequence matches that of different humans. The frequency of Neanderthal matches would be the same for all human populations if gene flow between Neanderthals and humans stopped before human populations began to develop genetic differences. But that’s not what the study found. Looking at a diverse set of modern humans–including individuals from Southern Africa, West Africa, Papua New Guinea, China, and Western Europe–the researchers found that the frequency of Neanderthal matches is higher for non-Africans than for Africans. “How these peoples would have interacted culturally is not something we can speculate on in any meaningful way. But knowing there was gene flow is important, and it is fascinating to think about how that may have happened,” Green said. The researchers were not able to rule out one possible alternative explanation for their findings. In that scenario, the signal they detected could represent an ancient genetic substructure that existed within Africa, such that the ancestral population of present-day non-Africans was more closely related to Neanderthals than was the ancestral population of present-day Africans. “We think that’s not the case, but we can’t rule it out,” Green said. The researchers expect many new findings to emerge from ongoing investigations of the Neanderthal genome and other ancient genetic sequences. 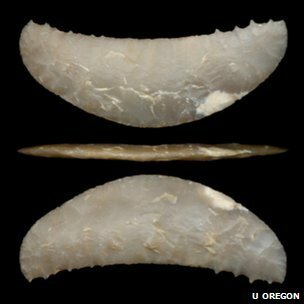 Paabo’s group recently found evidence of a previously unknown type of hominid after analyzing DNA extracted from what they had thought was a Neanderthal finger bone found in Siberia. Green is also taking part in that continuing investigation. A construction crew working on a highway in 1955 pulled up this dugout canoe from a Dutch bog. It’s almost 9 feet long and was radiocarbon-dated to 8500 B.C. For the second time in half a century, the remains of what appears to be a dug-out canoe have been discovered in Arklow, Co Wicklow. In a curious coincidence, both finds were by the same person, local man Peter Dempsey. The National Museum of Ireland confirmed yesterday that the first discovery made in 1966 was a dug-out canoe which was recorded and photographed by the museum at the time. Mr Dempsey, who is mayor of Arklow, said he was feeding ducks on the riverbank close to the locally known 19-arch bridge, when he saw the second canoe last Friday. As the original canoe had been returned to the water after a record was made by the museum, Mr Dempsey said he initially thought his latest discovery was the same canoe. However, Nessa O’Connor of the National Museum said photographs appeared to suggest it was a second canoe. Ms O’Connor said personnel from the museum would travel to Arklow to view the find, but from an initial perusal of the photographs, she said there was a strong likelihood that it was indeed a canoe. Fashioned from trees as primitive boats, the canoes could be as much as 5,000 years old. 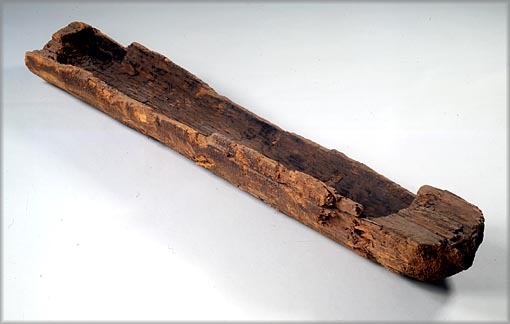 The longest dug-out canoe found in Ireland is currently in the National Museum. With a length of about 56ft, it was found in Co Galway. It is thought it served as a primitive ferry. While his first find was returned to the water, Mr Dempsey is hopeful space can be found for the latest discovery in the Maritime Museum in Arklow. “I think it may have floated down to Arklow after floods in March,” Mr Dempsey said. The mayor said he had been telling his grandchildren about his 1966 find moments before he went outside to feed ducks on the riverbank and saw the latest find. “I wondered was it the same canoe or was it part of it, but it seems to be a completely different one,” he said. (PhysOrg.com) — A new replica of an early modern human brain has provided further evidence for the theory that the human brain has been shrinking. The skull belonged to an elderly Cro Magnon man, whose skeleton is called Cro Magnon 1. The entire skeleton was discovered in 1868 in the Cro Magnon cave in Dordogne, France, and has since become one of the most famous Upper Palaeolithic skeletons. Using new technology, researchers have produced a replica of the 28,000-year-old brain and found that it is about 15-20% larger than our brains. 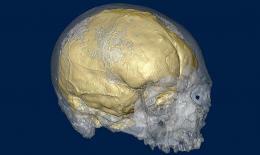 The researchers, including anthropologist Antoine Balzeau of the French Museum of Natural History, said that an initial assessment of Cro Magnon 1’s skull supported the theory that brains have grown slightly smaller over the past tens of thousands of years, reversing an earlier trend toward larger brains. For instance, different parts of the brain have different functions. The researchers found that the Cro Magnon brain appears to have had a smaller cerebellum – the brain region linked to motor control and language – than our brains today. The researchers explain that this finding shows that some parts of the brain are more “compressible” than others, while other regions seem to provide a benefit by growing larger. At a press conference yesterday, researchers announced the completely unexpected: a Siberian cave has yielded evidence of an entirely unknown human relative that appears to have shared Asia with both modern humans and Neanderthals less than 50,000 years ago. The find comes courtesy of a single bone from individual’s hand. Lest you think that paleontologists are overinterpreting a tiny fragment, it wasn’t the shape of the bone that indicates the presence of a new species—it was the DNA that it contained. The paper that describes the finding comes courtesy of the Max Planck Institute’s Svante Pääbo, who has been actively pursuing the sequencing of the Neanderthal genome. It seems likely that this particular bone fragment was targeted due to suspicions that it might also provide an additional Neanderthal sequence. The site, called Denisova, is in the Altai Mountains of southern Siberia, an area that has had hominins present as early as 125,000 years ago. The sample itself came from a layer of material that dates from between 30,000 and 50,000 years ago. Neanderthal DNA was found in a sample from the same time period less than 100km away, while artifacts indicate that modern humans were also present in the region by 40,000 years ago. So, there was no apparent reason to suspect that the bone would yield anything more than a familiar sequence. And in fact, most of the first half of the paper simply describes the methods used to construct a complete sequence of the mitochondrial DNA, including over 150-fold coverage of the genome, and an alignment program designed to account for the errors typical of ancient DNA sequences. About the only surprise here is that Pääbo’s group has switched from using 454 sequencing machines to those made by Illumina. Various checks indicate that the sequence the authors obtained contains damage that’s typical of ancient DNA, and that it all comes from a single individual. So far, quite typical. Things got quite unusual when they attempted to align the sequence to the mitochondrial DNA from the hominin species that were likely to be present at that time and place: human and Neanderthal. Instead of clustering with one or the other, the Denisova mitochondrial genome was a clear outlier, having about 385 differences with the typical human mitochondrial genome. In contrast, Neanderthals only differ from modern humans by an average of 202. The obvious interpretation is that the Denisova lineage split off before modern humans and Neanderthals did. If we accept that Neanderthals are a distinct species of hominin (and we do), then this sample clearly represents yet another one. Building a tree with the chimpanzee genomes and assuming a divergence time of 6 million years, the data indicates that the Denisova lineage diverged about a million years ago. At that point, Homo Erectus was already a global species, but our human ancestors were still in Africa. That suggests that the Denisova variant probably originated in, or at least near, Africa as well, although there’s no way to tell whether it was a distinct species before it started migrating, or whether it became an isolated population because of a migration. The paper is in the format of a Nature letter, which allows only a paragraph for discussion. The authors use that space primarily to note that, 40,000 years ago, southern Siberia was a very busy place as far as hominins are concerned, with at least three different species present within a very narrow time frame. If we accept that the Indonesian hobbits are yet another distinct species—and the relevant community seems to be leaning that way—then it appears that there were at least four distinct hominin species cohabiting the globe in the very recent past. As surprising as that is, it’s only a small fraction of the implications of this work. For starters, there’s the whole idea that we can identify a new species without having any idea what it actually looked like—in fact, without having any idea of whether it would be physically distinct enough from any of the other hominin species around that we’d even have known it were a separate species based on the bones. The authors also briefly touched on a separate issue: this ability will be unevenly distributed in space and time. DNA simply lasts longer in cool climates, as evidenced by the recent announcement that DNA had been obtained from a polar bear sample that was over 100,000 years old. So, any species that was stuck near the equator—like the hobbits—are unlikely to be in on the DNA revolution. This is especially unfortunate given the fact that, as noted above, a lot of the most interesting action in hominin origins seem to have been taking place in Africa. Then there’s the whole question of what else we might be missing. Avoiding contamination issues with modern DNA is easiest if the entire excavation is designed around a sterile technique from the start, meaning bones that have been previously excavated aren’t ideal. At the moment, at least, sequencing from a single sample is also pretty labor intensive (this paper had seven authors), meaning we aren’t likely to be able to just start sequencing any bone fragments we stumble across. Figuring out how to prioritize what might be informative will be a real challenge. If that seems like a lot of questions for a short and fairly technical paper (and it is), it’s a product of the fact that this paper seems truly exceptional. Because of the rich history of most fields of science, there aren’t a whole lot of truly unexpected results, since you typically know that there are people working in a given area. But this finding is truly a stunning one, and really seems to be a complete surprise.